Today’s Sun is 40 percent brighter than it was when it was born 4.6 billion years ago! In 1 billion years the Sun will release 10 percent more energy than it does now! What does that mean for civilization on Earth? It means the Sun’s heat output will result in complete chaos here on Earth, and at one point the Sun will consume the Earth! First, as the Sun heats up the moist greenhouse effect begins to kick in. The moist greenhouse is when oceans begin to evaporate into the atmosphere and eventually off into space. In the atmosphere water acts as a greenhouse gas which causes Earth to trap more heat, which causes even more water to rise to the atmosphere, thus ending surface life on Earth. Why are the oceans so important? According to scientist every living organism thrives on water with the exception of very few prokaryotic organisms. During this moist greenhouse effect temperatures on Earth will soar to a whopping 700 degrees Fahrenheit! Earth’s beautiful landscape will be that of a Venusian inferno. Thick clouds of sulfur and carbon dioxide will fill the air because the greenhouse effect will be so intense. As time progresses and the Sun brightens, the habitable zone ( or HZ for short) moves further out into the solar system. The habitable zone is the region some distance from the Sun where water on a planet can stay in its liquid form. The inner boundary of the HZ is defined by the point where water would boil and evaporate, and the outer boundary of the HZ is defined by the point where water would freeze. What happens to Earth when it is no longer in the HZ? Before Earth is consumed by the Sun, proactive Earthlings will have figured out ways to colonize Mars. But why Mars you might ask? I’ll tell you. 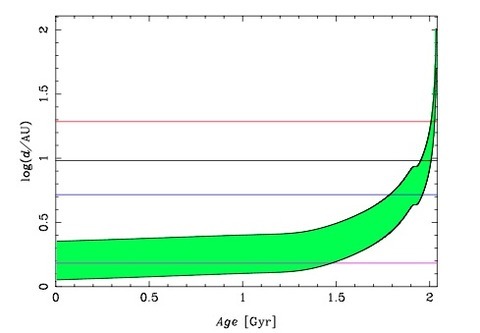 The graph below from Guo, Zhang, & Han (2010) shows how the habitable zone changes with time. The green shaded area on the graph shows the habitable zone (the top of the green area is the outer boundary of the HZ, the bottom is the inner boundary). The y-axis on this graph is the logarithm of the distance of various planets (represented by horizontal lines) in AU from the Sun (Note: one AU is the distance between Earth and Sun). Finally, the x-axis is the age of Sun in Gyrs ( 1 Gyr=1 billion years) starting from the point when the Earth first becomes inhabitable. Anytime a planet’s horizontal line crosses the green area it means that planet is in the HZ! The graph above shows how the habitable zone (or HZ) changes with time. The green shaded area on the graph shows the habitable zone. On the x- axis lies time in Gyrs (= one billion years). The y- axis is the logarithm of the distance expressed in astronomical units. The four lines show the location of different planets Mars (Pink), Jupiter (Purple), Saturn (Black), and Uranus (Red). Since the Sun will have a greater heat output, Mars will be in the habitable zone, and according to the graph Mars will remain in the HZ for 1.5 billion years! That’s 10x longer than the amount of time people have been around for! A closer HZ means Mars polar ice caps will melt into an ocean. If proactive Earthlings release carbon dioxide, plant plants (which produces oxygen), and distribute water on Mars it will make the martian planet habitable. Mars natural greenhouse effect will make its atmosphere thick as it once was. When Earthlings accomplish this process they have successfully colonized Mars. Remember though, Earthlings will have only 1.5 billion years until the Sun undergoes another evolution where it becomes much brighter. When this occurs, the Sun will consume Mercury, Venus, Earth, and make even Mars inhabitable. Earthlings will be forced to colonize elsewhere. But where? As Zachary mentioned in his Europa post, Jupiter’s moon has the resources to host life but one key element is missing and that is heat. Europa, according to leading theories , has a tremendous ocean under an icy crust. According to the graph below, Jupiter and all its moon will remain in the HZ for approximately 325 Myrs (Million Years). Heated by the Sun, Europa has the possibility of becoming a oceanic planet! The Sun will continue to age and increase in size. Eventually the Sun will consume Jupiter and its moons, thus leaving Earthlings with two options; to perish in an inferno-like moon or continue advancing as a civilization. I dont know about you all but I prefer the advancement of civilization. Earthlings will have no choice but to move to the beautiful moon of Saturn, Titan. Titan is the second- largest moon in the Solar System, and is 80% more massive and 50% larger than Earth’s moon. Earthlings, according to the graph, will have approximately 130 Myrs (Million years) to inhabit Saturns moon, Titan. Titan has an organic- rich atmosphere and surface. Its atmosphere has approximately the correct temperature and composition to support the existence on liquid! But unfortunately, data from the Hubble Telescope and observations suggest existence of liquid methane found in oceanic areas around Titan. This diagram basically shows the birth of our Universe and how it has changed over 13.7 billion years. The Y-Axis shows the size and location of the visible Universe. 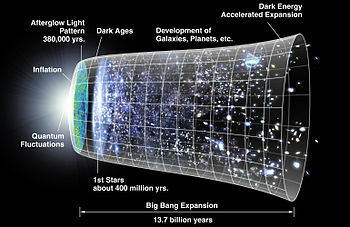 The X-Axis represents time from the beginning of the Big Bang expansion to what our Universe looks like today. As You can see the Universe was much denser in its early eras. I have yet to hear a story about how the Universe all began that I understood, and if you’re anything like me, you would like to know what put us humans on the map. In science and in life, it is difficult to prove and understand why things are the way they are when you weren’t there to witness them firsthand. To illustrate the origins of the Universe (as well as life, gravity, etcetera), scientists, astronomers and other diligent researchers have spent decades studying and testing hypotheses to come up with theories. Two commonly known theories are the Steady State Theory and The Big Bang Theory. A model of cosmology, the science of the origins and development of the Universe, that gained some popularity in the 1950s and 60s is the Steady State Theory. The Steady State Theory basically asserted that the general character of the Universe is not changing over time but it is growing (See Diagram Below). For example, imagine that you have an infinitely big flat sink with no drain, and you turn the faucet on. The water spreads out uniformly over more and more of the surface of the sink (because you are always adding more and more water from the faucet). Now imagine that the Universe was that water. This is like the Steady State Theory. The water filling the sink looks the same everywhere no part would be denser than other parts because water doesn’t bunch up anywhere. Water covers the surface equally. At the same time, the Universe would still be expanding. The Steady State Theory predicts two main things about the Universe, that the Universe is expanding and that its density is always the same because it doesn’t change over time. The first figure shows what scientist believe happens with the Big Bang Theory and the second figure shows what scientists believe happens with the Steady State Theory. In the Big Bang as time pass the space between the points grow and become less and less dense. In the Steady State Theory the density of the Universe remains the same and looks the same as time passes. Another model of cosmology is the “Big Bang Theory”. The Big Bang Theory asserts that the Universe in its earlier eras was denser and much hotter than the Universe today. The visible Universe that we observe today was initially as small as a pore on the skin. As time passed the space between particles in the Universe grows and has been decreasing in density every since the beginning (See Diagram Above). It asserts that the fabric of space itself began expanding like the surface of an inflating balloon. For example, imagine that there are dots all over the surface of a balloon. As you start to fill the balloon with air the dots on the balloon become further and further apart from each other. The concentration of the dots is decreasing. Therefore the Big Bang Theory makes two main predictions, that the Universe is expanding and that the Universe actually evolves over time (The Universe was denser in the past now it is less dense). Observatories looked further back into the Universe’s early eras and noticed contradictions to the Steady State theory. The Universe does not look the same at all times. Things looked denser. There were two main observational results over the past few decades that led astronomers to certainty that the Universe began with the Big Bang. First, they found out that the Universe is expanding and changing over time. Second, astronomers could actually observe the Cosmic Microwave Background Radiation. The Cosmic Microwave Background Radiation, also known as the CMB, is a faint glow of light that fills the Universe. It is the residual heat of creation and the oldest light that we can see with the right equipment. The CMB is just more evidence that proves why the Big Bang Theory is the most logical, accepted theory of the origins of the Universe. It is the afterglow of the Big Bang explosion. Looking at the Universe in its beginning stages, picture it as a room that is filled with dust and has no open windows or openings of any kind. The dust would make the room dark and gloomy. Because there is no way for the dust to escape the room, the room will continue to be dark with a high density of dust. What would happen if you turn the lights on in the dusty room? The room packed with dust, even with the lights on, looks dark because the light cannot escape the dust and the dust cannot escape the room. Now imagine that we open the windows and dust begins to escape the room. Can the light escape the dust? Now that the room has opened up the dust has spread over more territory and the light can finally get through and reach our eyes. In this example, the dust is like all of the other atoms that the Big Bang created that were compacted and the light is like the CMB (See Diagram Below). The escape of the CMB requires for the Universe to have once been compacted and dense. What the Universe actually looks like agrees with the Big Bang Theory, which is why it is the favored model of cosmology. The orange, blue, and green dots represents protons and electrons. 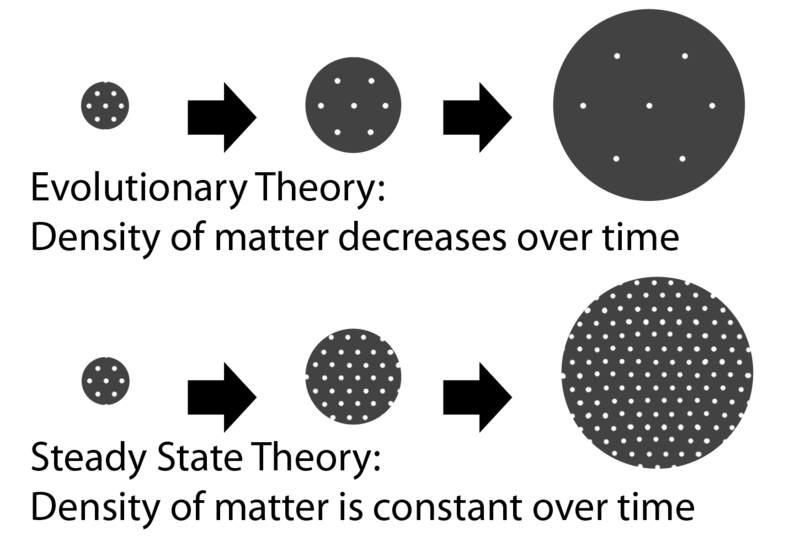 When all of the particles were close together and dense the light (yellow) bounced off all of the particles because the high density trapped the light. Over time, as the Universe began to expand and become less dense the protons and electrons formed atoms and became spread out enough so that the light had room to escape. Describing the Universe doesn’t have to be completely complicated. Right? But if you still find it difficult to understand the origins of the Universe, even after reading this post, then I encourage you to take timeout to plan a visit to the Adler Planetarium and check out our newest exhibit “The Universe: A walk through Space and Time”.